This vast sheet of ice is considered by many to be the Earth's last true slice of wilderness. You don't come on holiday here; you come on an expedition. Antarctica is nearly twice the size of Australia and with most of its land over 2 km high, it is a polar desert. But the frozen continent is far from lifeless as many species thrives here, including penguins, seals, whales, birds and orcas. Apart from whales-watching and visiting penguins, there are plenty of things to do and see in Antarctica that remains unknown to most travellers. Growing in popularity are activity-based cruises, with optional extra activities. These include kayaking, diving and snowshoeing, which are ideal for those who want to experience the Antarctic just that little bit closer. Float quietly past leopard seals sunning themselves on ice flows, circumnavigate icebergs floating in the middle of the sea, and paddle with penguins jumping through the air at the front of your boat as you kayak around Antarctica's waters. Most expeditions to Antarctica will also offer zodiac tours of bays and icebergs. Seeing whales, seals, and calving glaciers from a zodiac is a moment you won't forget. Getting off the ship to see things in an intimate manner is a must. Plunged into darkness for six months of the year, yet with almost constant daylight throughout the austral summer, Antarctica is the most unexplored, hostile and extraordinary place on the planet. Few people have travelled to Antarctica and even fewer have actually stayed overnight on the continent. People sleep on expedition ships or fly to Antarctica to step on the land, but not many people have actually camped in the middle of the snow beside snoring leopard seals. Yes, it's cold and uncomfortable, but camping on Antarctica as the early explorers did is a must! Stopping at Port Lockroy is a fun stop on an Antarctica itinerary. It's a spot where you'll run into other expeditions and get the chance to talk with the staff of the English research station. There you can browse the museum, play with the penguins and buy some souvenirs and even post cards that can be mailed from the bottom of the world to your loved ones back at home. Deception Island is one of the safest harbours in Antarctica that just so happens to be an active volcano. Back in the days, it was an old whaling station so on the shores of the island, you will see old oil drums, boilers, and whale bones from a darker time. It is s as horrifying as it is beautiful. Nicknamed the Fuji Funnel, Kodak Canal and Agfa Alley the Lemaire Channel is one of the top things to do in Antarctica for photographers. As you pass through the narrow Lemaire Channel, you will spend hours standing outside on the deck taking photographs of this spectacular scenery. 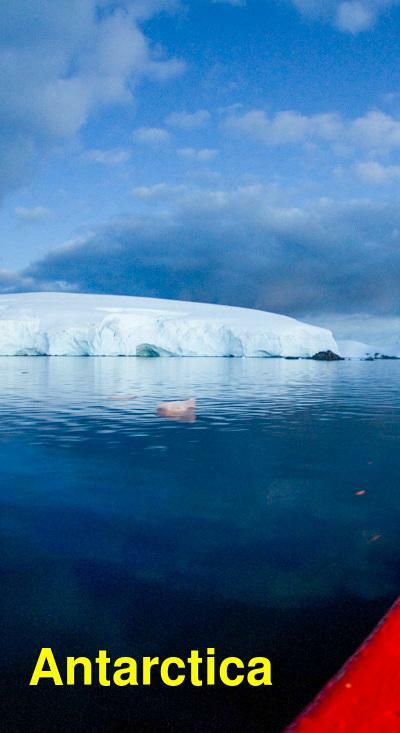 One of the greatest things to see in Antarctica is also an actual iceberg. The ice is massive, colourful, and it creates some of the most interesting formations. How much does it cost to travel to Antarctica? Finding your way to this remote continent is not an easy or inexpensive task - that is, unless you book an organized cruise out of South America. The prices of cruises and tours will vary greatly. The length of the trip and the level of luxury on the ship are the two biggest factors affecting the price. The cruises below, offered by a variety of companies, are the cheapest around. Many are priced around $6,000, and all of the cruises/tours listed here are priced under $10,000 (USD). Hey, it's not cheap, but it's the chance of a lifetime! The Antarctic Peninsula is anything but a world of white desolation. Join Antarctica Classic on a true adventure to a world of immense scale and visual splendour. Passing huge icebergs in the flat calm of a polar morning will reshape the way you look at your world. Encounter huge whales, enormous rookeries of penguins, and stunning landscapes few have ever witnessed. This 11-day expedition will introduce you to the magic of the South Shetland Islands and the Antarctic Peninsula. The tour starts in Ushuaia, with transfer from the airport included. Enjoy the sights and sounds of the world's most southerly city and get more specific information on your ship, the G Expedition and your upcoming adventure at the welcome desk in the lobby of the hotel. On the next day, enjoy a free morning in Ushuaia. Do any last minute shopping, explore the town, or visit the surrounding countryside. Embarkation on the G Expedition begins in the afternoon at the port in Ushuaia. Enjoy the evening sailing through the Beagle Channel. The G Expedition is at home in this part of the Southern Ocean, known for the unimpeded never ending fetch of the winds that encircle the Antarctic. As the Expedition crosses the passage there will be time to become acquainted with the ship and frequent the common areas that include the lounge, dining hall, library and lecture hall where we meet our guides, ship's crew and expedition staff. On your third day, begin lectures and information sessions to learn the extraordinary human and natural history of the Antarctic region. Over the next 4 days the G Expedition will navigate southwards making stops in the South Shetland Islands then through the Bransfield Strait and to the Antarctic Peninsula. The goal is to attempt two excursions per day while navigating through the area but the itinerary and daily schedule will be based on the local weather and ice conditions. During the voyage, learn about some of the most important and dramatic expeditions to this remote corner of the world. Leave Antarctica and head north across the Drake Passage. In between bird watching and whale watching and enjoying some final lectures by the expedition staff, this is a chance to relax and review the adventures of the past week before returning to Ushuaia. The best way to experience the wildlife of the Drake Passage is to be on deck keeping a lookout for Albatross, Prions, and Whales! After disembarking the G Expedition on the last day, passengers will receive a complimentary transfer to either the airport or a central location where luggage can be stored. Like the "Antarctica Classic" tour, this 13-day expedition introduces you to the magic of the South Shetland Islands and the Antarctic Peninsula, but adds on two additional days to better explore its majesty. Part of the reward of arriving in Antarctica is the challenge of negotiating the Drake Passage and the G Expedition will bring you there safely. Encounter leopard seals lazing on ice floes and immense rookeries of penguins surrounded by towering glaciers. The G Expedition's expert guides and lecturers offer knowledge and insight that really bring the nature and history of the region to life, creating the adventure of a lifetime. The itinerary remains the same as the "Antarctica Classic" tour with an additional optional polar plunge, a visit to an abandoned whaling station or a working scientific research station, from which you will gain a new perspective on this part of world. Antarctica Classic in Depth includes accommodation in a hotel in Ushuaia as well as an expert guide, meals, transport and activities. Enjoy this 11-day voyage, beginning and ending in Ushuaia, on the Sea Explorer for a perfect blend of luxury and adventurous exploration. The Sea Explorer holds 114 passengers and has huge windows for views and public spaces. Your first day in Ushuaia is free for you to relax, or enjoy the Argentinean leather markets and succulent lamb dishes that make Patagonia famous as you explore the southernmost town in the world. Our optional evening briefing is a great opportunity for you to ask questions and to meet some of your fellow travelers. The next morning is free to explore Ushuaia until a mid-afternoon transfer to the ship, where you will be greeted by the Expedition Team and ship's officers at a safety and orientation briefing followed by the Captain's welcome dinner. After dinner, relax and take in the mountainous scenery on an early evening sail down the Beagle Channel past Magellanic Penguin, Rock Cormorant, and Sea Lion colonies. Your first day on the ship will begin with a series of informative and entertaining presentations on the wildlife, history, and geology of Antarctica. Helpful briefings on expedition safety and environmental regulations will also be held in the comfortable presentation hall. The length of the crossing will depend on the sea conditions, but they are usually in sight of the South Shetland Islands of the Antarctic Peninsula on the evening of Day 4. The Expedition Leader and Captain will create a flexible itinerary based on the weather and ice. The route will stress the most scenic bays and channels of the Peninsula with stops at penguin rookeries, seal wallows, bird colonies and whale feeding areas as well as sites of historic and scientific interest.The trip may include picturesque Neko Harbor, sheltered Paradise Harbor, the Humpback Whale favored Wilhelmina Bay, the striking Lemaire Channel, the wildlife-filled Penola Channel, or the majestic Neumayer Channel. You may stop at an active scientific base such as Poland's Arctowksi or Ukraine's Vernadskiy as well as an historic base such as U.K.'s Port Lockroy or Wordie House. Adelie, Chinstrap and Gentoo Penguins abound, and Weddell, Crabeater and Elephant Seals are often found to rest along with predatory Leopard Seals and the aggressive Antarctic Fur Seal. Minke and Humpback Whales are frequent visitors in the late season and Orca sightings are also common. You will arrive at Ushuaia in the early hours of Day 12. Morning disembarkation will let you catch a flight to Buenos Aires or stay in Ushuaia for more sights and adventure. The time saved by flying south on this 12-day tour, allows for a more substantial exploration below the Antarctic Circle. Your journey commences in the southern Chilean port city of Punta Arenas. You will gather at a central location and transfer to the airport for the two-hour flight across the Drake Passage to Antarctica. This flight is included in the price of your voyage. Upon arrival at King George Island, you will embark the ship via a zodiac. After settling into your cabins and exploring your new surroundings, you will meet the expedition team and fellow passengers with a welcome cocktail and your first meal onboard in Antarctica. Having crossed the broad expanse of the Bransfield Strait overnight, you will wake up on your second day to see the towering peaks of the Antarctic continent for the very first time. There is much to see and experience on your way south and you will make shore landings in locations that provide great wildlife encounters, or the chance to stretch your legs on a short or long hike, such as Port Charcot. Visit a working scientific base (Vernadsky Station), to learn about the important ongoing climate-related research. Hike and explore the old British Antarctic Survey hut - Wordie House. Head to Petermann Island, home to a substantial Adelie penguin rookery. The view to the north, of Mount Shackleton and Mount Scott is also very impressive. These towering granite sentinels mark the southern entrance to the Lemaire Channel. The nearby Pleneau Island will also offer great opportunities for shore landings. Just off shore, in the shallow waters of the Penola Strait, massive icebergs run aground. Constant wind and wave action sculpt these gargantuan chunks of ice into fantastic shapes, revealing more shades of blue than you could ever imagine. For many, a zodiac cruise here will be a highlight of the voyage. It is somewhere in this vicinity that you will get the opportunity to spend a night ashore camping for those interested, if weather conditions permit. They have all the gear and an expert team of guides to make this unique experience happen. There is no need to pre-book, as you can decide this on the day and this activity is included in the price of your voyage. Given optimal ice conditions, the aim is then to sail south of the Antarctic Circle. A favoured landing site here is Detaille Island, home to an abandoned British science hut. 'Base W' was established in the 1950's and is in a remarkable state of preservation. For history lovers this is a fascinating place, providing a glimpse into the harsh life of early Antarctic scientists and researchers. The next stop is Marguerite Bay, home to several important science bases - Rothera (UK), San Martin (Argentina), Carvajal (Chile) and features rich history. As the ship sails back to South America, the educational presentations continue and enjoy an entertaining and memorable voyage recap by the Expedition Leader. Join the photography experts in the multimedia room and download and back up your precious images. If weather conditions allow, you will make a rounding of Cape Horn. This fabled stretch of water is home to legendary tales of exploration and early navigation. Approaching the entrance to the Beagle Channel in early evening light, enjoy a special dinner attended by the Captain of the ship. You will arrive into Ushuaia, Argentina, in the early morning. Guests will be transported to their hotels or to the airport for return flights home or other destinations in South America. Otherwise enjoy a night in town or venture further afield to explore the highlights of Patagonia. Discover the magic and wonder of Buenos Aires, Ushuaia, Tierra del Fuego, and the White Continent on this Adventure to Antarctica Tour. Enjoy the "Paris of South America," Buenos Aires, before overnighting in Ushuaia. Enjoy a Portenos tour, viewing the Teatro Colon opera house; Avenida 9 de Julio honoring Argentinean independence; the Recoleta Cemetery, where Eva "Evita" Peron rests in her tomb; the Presidential Palace; the Casa Rosada; and the San Telmo barrio lined with cobblestone streets. Browse the boutiques of Calle Florida or visit one of the many renowned art museums. Or perhaps you'll choose to take the optional Tigre y Delta trip and pass by historic mansions and former residences of Buenos Aires' aristocracy; then a cruise takes you among a network of homes built on stilts. In Ushuaia, the world's southernmost city, situated on the Patagonian peninsula overlooking the historic Beagle Channel, explore the "Land of Fire" at Tierra del Fuego National Park. Walk the shores of Roca Lake, see evidence of the settlements of the now-extinct Yamana indigenous people, and visit Lapataia Bay where the Panamerican Highway ends. Begin your Antarctic cruise aboard the stylish and comfortable MS Midnatsol by cruise south through the fabled Drake Passage, named for the legendary Sir Francis Drake. Warmer waters of the north meet the colder, denser waters of the south here in the Antarctic Convergence, making the area rich in marine life. Spot whales and seabirds as you begin this voyage of exploration. Experts provide presentations on history, biology and geology throughout your adventure. The next eight days are filled with discovery! Weather conditions determine each sailing's final itinerary. Regardless, adventure awaits. First, cruise through the astounding glacier-lined Lemaire Channel - "Kodak Gap" - and enter the majestic Neumayer Channel with its imposing cliffs. Humpback, Killer and Minke whales - and icebergs - are common sights. PolarCirkel (rugged excursion) boats take you to incredible locations along the Antarctic Peninsula which could include: Half Moon Island, a small island in the South Shetland chain boasting mountainous views and a nesting place for Chinstrap penguins, Kelp gulls and Antarctic tern. Continue your visits by PolarCirkel boats to Whalers Bay, Deception Island, featuring an active volcanic caldera, where ruins from a 20th-century whaling station rest ashore. The black volcanic sand and waters upon the beach are warmed by geothermal vents. On the next day, visit Neko Harbor, part of the Antarctic mainland nestled in the fjord-like Andvord Bay, where penguins plus Elephant and Weddell seals are often spotted. Continue your adventure to Wilhelmina Bay, where mountains and high glaciers create dramatic scenery. View the 1915 wreck of the Norwegian ship, Guvernoren. Visit the Yankee Harbor, on the South Shetland Islands. It provides a natural safe haven for sailors and explorers like you who come to see the large colony of Gentoo penguins. Finally embark upon a thrilling passage through the scenic Errera Channel and its dramatic icebergs. Once on shore of the Cuverville Island you will be surrounded by nesting penguins. Return to Buenos Aires for a farewell dinner including a magical Tango show you'll never forget.